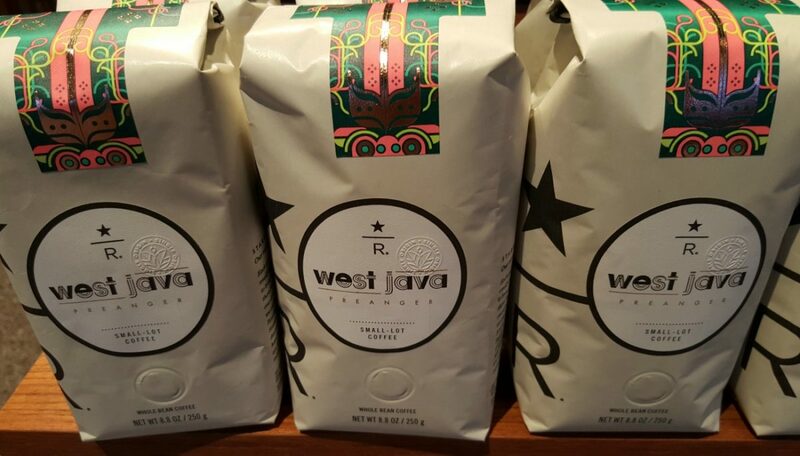 Starbucks is now phasing in an all new look to their Reserve lineup of whole bean coffees. It’s all black. It was a little over one year ago when Starbucks moved from a horizontal silver and black designed package to the bright and crisp white packaging, which is ending now. The new packaging is solid black. There are only two identifiers of what coffee is inside – the card clipped to the front and the tiny printed words on the lower right corner of the coffee, on the backside. I should mention that I believe that Starbucks is telling their Reserve stores not to display both styles of coffee packaging, and to pull the old packaging off the floor as of March 22nd. Since the only front identifier of the coffee is the card clipped to it, it’s possible to have the wrong coffee clipped to the wrong card. It could easily and innocently happen if a partner grabs a case of one coffee and the wrong cards and starts clipping them together. Granted, this should be rare, but I recommend that customers look at the backside of their Reserve coffee and double check that it matches the card attached to the front. It’s possible the cards could fall off or get lost. 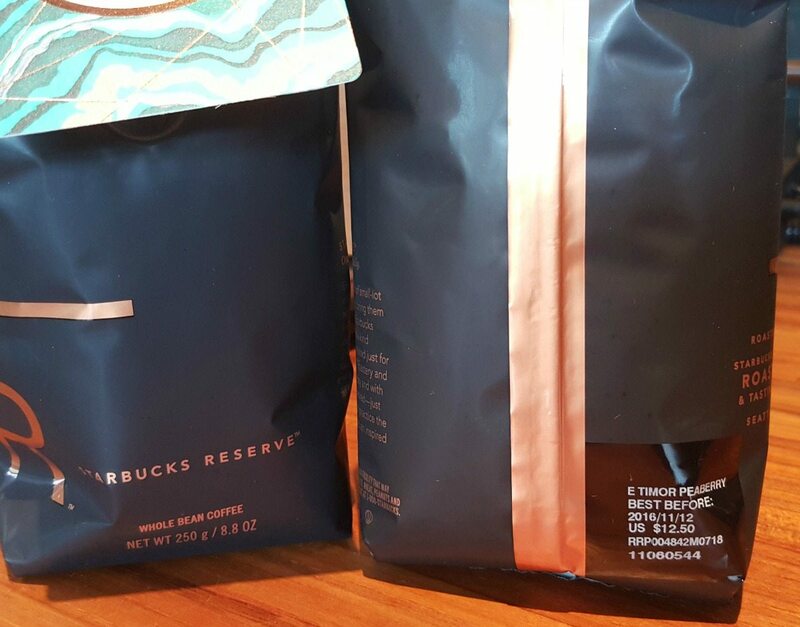 Once you bring the coffee home, especially if you are a fan of the Reserve coffees and have more than one black bag of coffee at home, the customer at home is left with several identical black Flavorlock bags absent the tiny printing on the back. It is possible that a customer might try to take a card without buying the coffee, leaving too few cards for the amount of coffee to be sold. From the perspective of the customer, if for some reason you buy a bag of coffee and don’t get a card (because lost, stolen, too few…) if would feel as if you’re really missing out! It would feel a bit disappointing. The bottom line is that you should check the back of your coffee now. Make sure you are getting the coffee you want, just in case the card has gone missing or is attached to the wrong coffee. Starbucks seems a little unaware how popular those cards are and how they motivate people to buy coffee. While the number of people who collect Reserve tasting cards is tiny compared to those collect the actual Starbucks cards that you put money on, they really do exist! 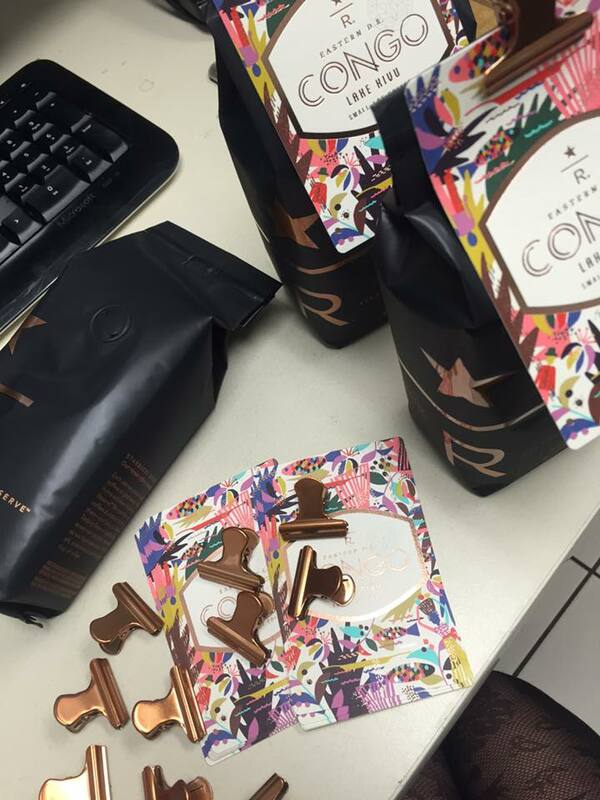 There is a Facebook group dedicated to trading /collecting the Reserve Starbucks tasting cards. There is a Starbucks customer in Canada who puts a lot of work into tracking the Reserve cards. I too have a website with lots of images of the tasting cards, though my site is more focused on coffee education (and still somewhat under construction). It’s not clear that there will be very many extra tasting cards either, making collecting them all the more difficult. 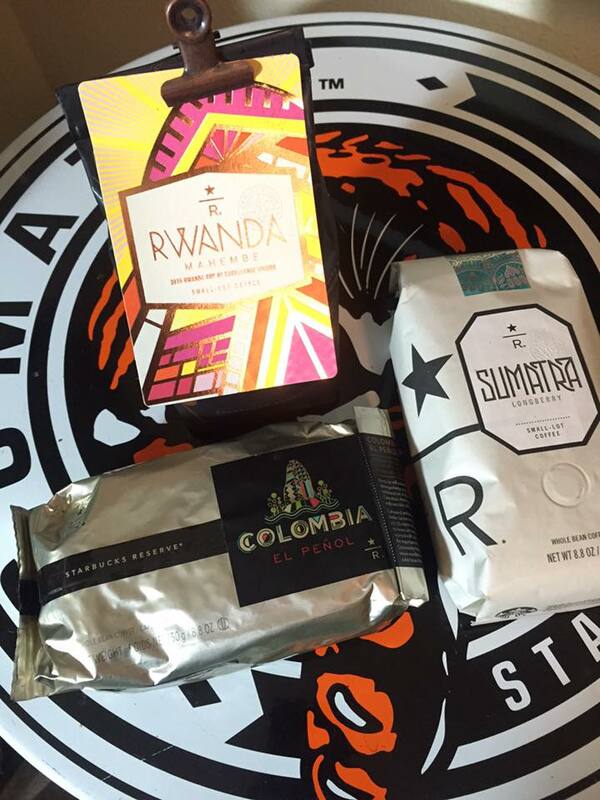 Starbucks recently started offering their second Cup of Excellence winning coffee, Rwanda Mahembe. There are two other Rwanda cup of excellence coffees available that do not, at this time, have a card for this. The only one with the card is Rwanda Mahembe. 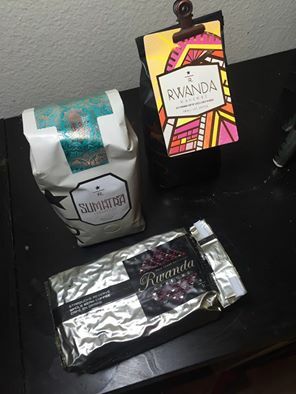 By my educated guess (by looking at data available on the Cup of Excellence website) Starbucks sourced about the same quantity of coffee for all 3 of their current Cup of Excellence, Rwanda coffees. I honestly thing that the two without cards (Rwanda Maraba and Rwanda Muyange) would sell better if they had cards! 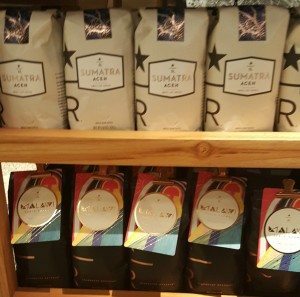 In any case, it’s your turn to weigh in on the new Starbucks Reserve packaging (or anything about the tasting cards too). Be a guest contributor on StarbucksMelody.com! Which Summer Dash Promo Did You Receive? 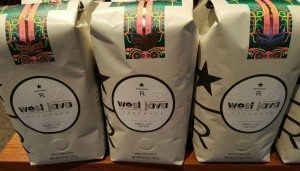 Starbucks Annual Meeting: New Food; Common; Mellody Hobson and More. In the past few months I’ve been given gifts of bags of coffee from 3 different indie coffee shops from 3 different states. . All 3 bags are black. All have their own individual label that is glued on. The bags of reserve coffee at my local store are kept behind the counter so a customer has to ask for them. That would help in keeping the clipped on card in place. As long as it’s on the right bag in the first place it won’t be a problem. I guess everyone likes black bags at this time. I liked the silver bags myself. The Christmas Reserve looked really nice in the black bag and clipped on card. But I can’t believe the partners will be too thrilled with now having to clip cards on all the reserve coffees. And yes, it will be a good idea to make sure the correct card is with the coffee you want. I’m interested myself to see how long the new packaging will remain in the lobby baskets with the Cards clipped. When we displayed the old white packaging with the tasting cards in a card holder attached to the basket sign, people would always take the tasting cards in mass amounts. I hope they will reevaluate the placement of the coffee blend name to the front. 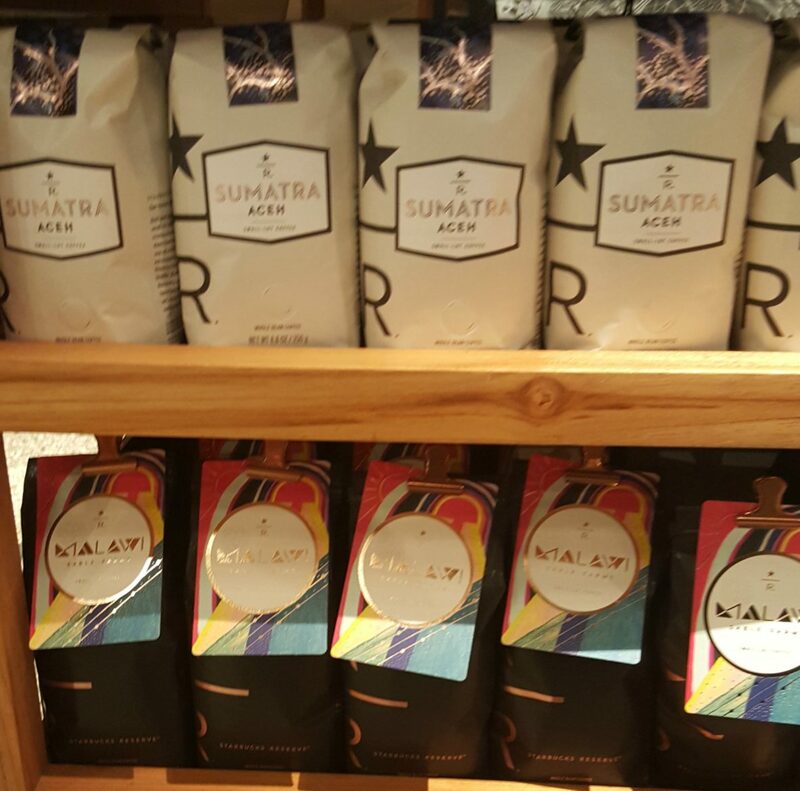 By the way what store did you find the Timor Peaberry and Malawai at? @Mike and Becky – Good points. This new packaging concept seems like the kind of thing that sounds good on paper but could look totally different when it comes to execution. We’ll have to wait and see. Great post Melody! And oh that’s awesome, I didn’t know the new bags with clips were also at the Roastery too now. This Tuesday when the reserve re-launches, they are posting a survey for partner feedback so I am going to definitely share some thoughts about the name placement and clipping card concern. The first time I saw the cards clipped to the bag was on the Christmas Reserve blends, which really helped them stand out since that was the very rare case of Reserve coffee being sold in non-Clover shops. I like the idea, but who thought it would make sense to not have the beans identified in large print on the front? Also, if the white bags are being taken down on the 22nd what is happening to them? Clearance sale at 50% off? Or do they have to get shipped back to Seattle to be used in blends? @Tex – That’s a good question. 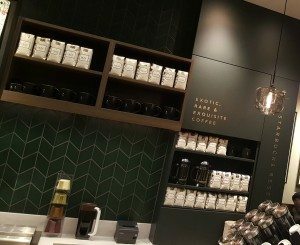 A significant amount of coffee will walk out the door in partner “mark out” – Starbucks employees get a one-pound bag of the core coffee each week as a perk of working there, but normally can’t get the Reserve coffees as part of the free perk. 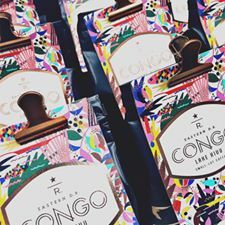 There’s a big thing now where the partners can use their mark out – free coffee perk- on the white package Reserve coffee. So a lot of coffee is going home with employees. A lot of the coffee will get brewed through – lots of customers will still be ordering Reserve coffee by the cup and partners will pull it out to brew by the cup. Other than that, I don’t know! Melody – thanks for the answer. i should have thought of that (hide the white bags under the counter and use for Clover brewing)…. Reserve beans will be all I buy from April 12 onward. And only on double star day. It also seems very wasteful to have a clip and a card for each bag. In my store, we sell a lot of clovers. We sell a good amount of whole bean as well, but about 75% of our reserve coffee is sold through the clover. that means that 8 clips and 8 cards will be discarded from each case.